Judy is a Past President and Treasurer of the Phoenix Area. Was Area Vice President for the Southwest and Treasurer. In 1993 Judy was recruited as one of the first Community Development Trainers for the USTA	to establish curriculum and training programs for community tennis associations. 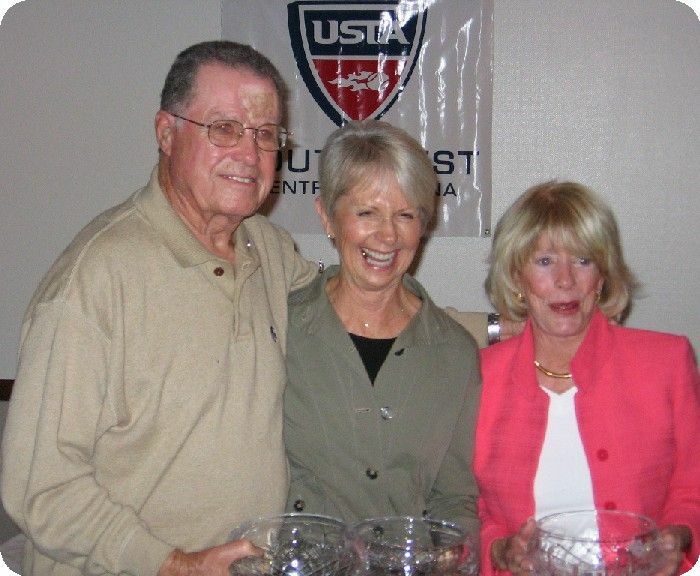 Judy has served on USTA National Committees including Community Development and SERV .In 1997 spearheaded the formation of the Maricopa County Tennis Coalition	to grow the game of tennis, funding several local tennis efforts. The William J Stark Travel Fund for Juniors is partially funded by Judy. She is a long time supporter of Phoenix Area. Community tennis fundraising events and much more. Began playing tennis at age 14. Having never taken a lesson he was one of the top junior players. George was #1 player and captain of his high school team and his college team. He reached the round of 16 in Men’s Doubles at Wimbledon in 1955. George is the winner of over 300 USTA sanctioned Southwest Tennis Championships. Represented USA on Gordon Cup International team, the Bitsy Grant cup Team, was undefeated on the US ITF Team Championships. He has served on the Board of directors for the Phoenix Area, Southwest Tennis Association and the USPTA. Actively promoting tennis giving clinics and exhibitions. Has run tennis tournaments, hits with juniors and pitches in where needed. George was a 2002 inductee into the Southwest Hall of Fame. Jeannie is a Past President of the Phoenix Area and is a contributing factor in its growth to what it is today. She took over a small tournament (Saguaro Holiday Tournament) upgraded it and developed it into the Fiesta Bowl which became a national tournament which was the primary money earner for Phoenix area. This was a labor of love and took countless volunteer hours. Her husband Barney Dreyfus came on board and made it a family project. Kudos to Jeannie for where we are today. She certainly belongs in our Hall of Fame.